A very long gap between this letter and the last one in November. I suspect John was occupied with getting ready to transit to a rehabilitation hospital in Philadelphia...the Broad Street Hospital...and found little time to write. It has now been over 3 1/2 months since his wounding...his "flesh wound", and the time it has taken so far to heal, is telling of the nature of his rehabilitation. 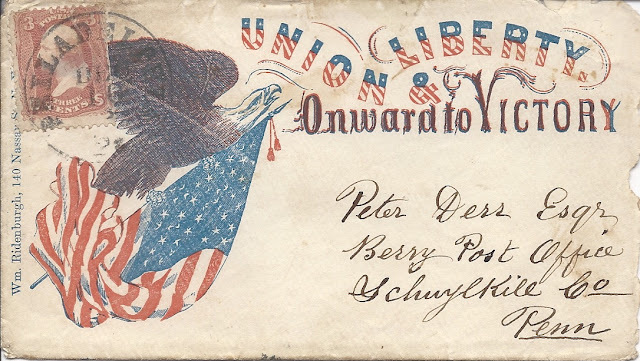 I have previously written about the state of soldier care during the Civil War and this is just proof that even a seemingly minor wound, could progress with a devastating result. 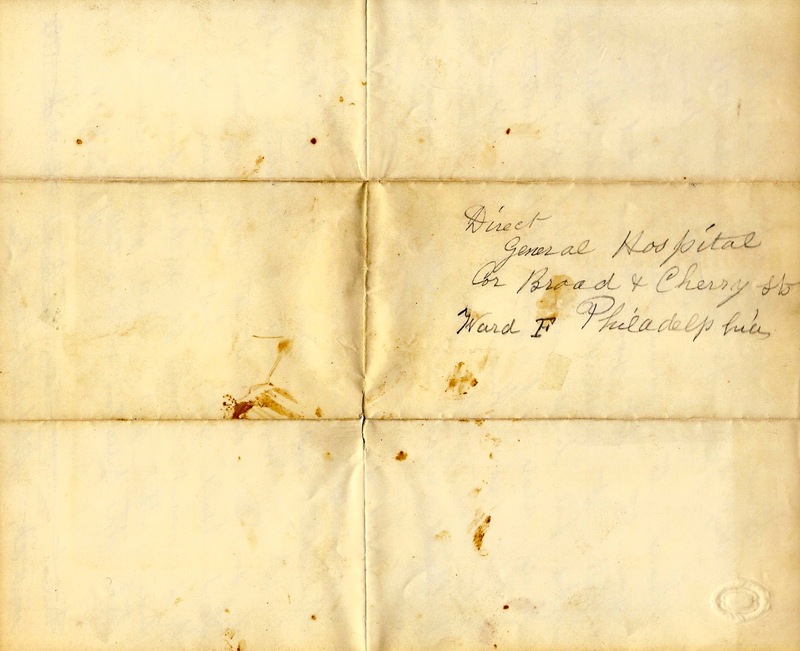 John describes his transit from Washington to Philadelphia and the date of his transfer. December 13, 1862...the same date as the arrival of Walt Whitman at the train station in Washington during his efforts to nurse his wounded brother back to health. Could they have passed in the train station? 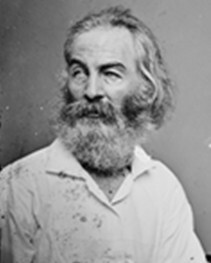 Could Whitman have said a comforting word to a soldier like John W. Derr while passing by? I guess we'll never know...but it is interesting to contemplate. 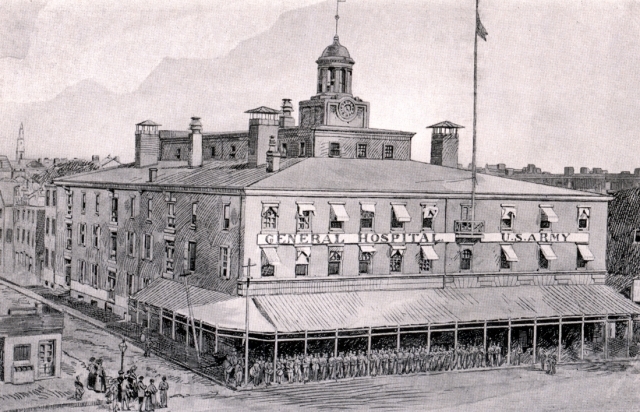 The Broad Street Hospital was located at the S.E. corner of Broad and Cherry Streets and opened in February of 1862. It could accommodate 525 patients. hospital were from the many prominent families then resident near by. then in charge being W. V. Keating. I take my pen in hand to inform this few lines to you to let you know that I am well at present time and I hope that these few lines will find you in the same state of good health. 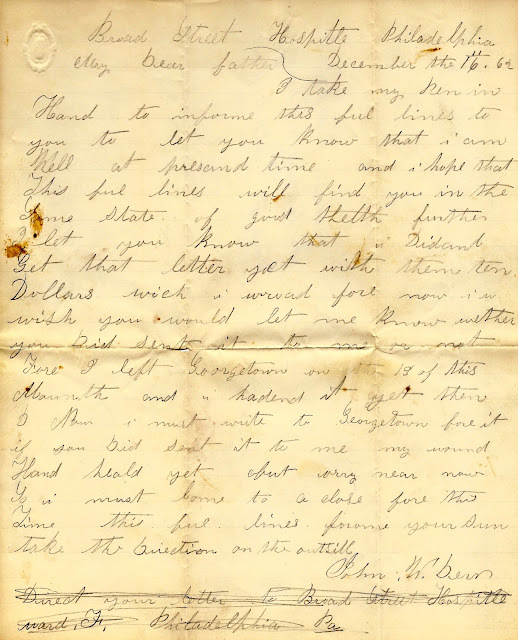 Further I let you know that I didn’t get that letter yet with them ten dollars which I wrote for. Now I wish you would let me know whether you didn send it to me or not for I left Georgetown on the 13 of this month and I hadn’t it yet. Then I now must write to Georgetown for it if you did send it to me. My wound hasn’t healed yet but very near now. So I must come to a close for this time. These few lines from your son. Take the direction on the outside. Thank you for sharing this. 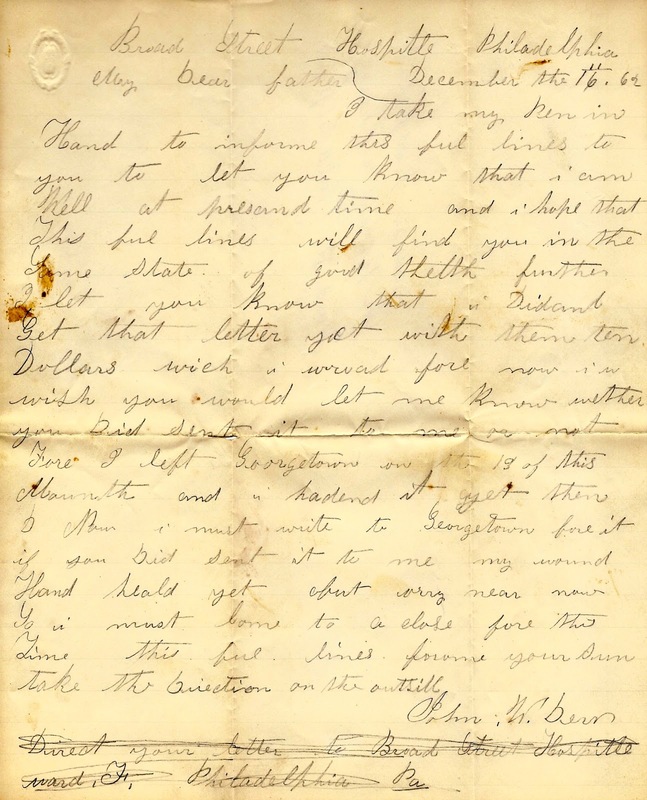 My husband's great grandfather John F Thompson, Pvt. Co.A 16th ME, Inf, Volunteers was wounded July 1,1863 at Gettysburg and sent to the General Hospital at Broad & Cherry St., later to Mower where he remained until it closed in 1865. The wound never properly healed and though he returned to work in Mass. he spent his last days at Togus Military facility in Augusta, ME. He died there 17 June 1903 at age 59 of the effects of his wounds. You are very welcome! Quite a bit of the information I obtain relative to my ancestors is from other people such as yourself who share their family histories. Thank YOU...for sharing.